Wimbledon's character underwent a tremendous change, i.e. from a village to a small town in 1894. The Wimbledon Urban District complete with an elected council was formed with the assistance of the Local Government Act 1894. The condition of the population of Wimbledon growing during the commencement of the twentieth century was recognized in the year 1905 when the urban district was created and named the Municipal Borough of Wimbledon. The power of selecting a Mayor was also given. After the first ten years elapsed from the new century, the early stages of the Wimbledon School of Art were established at the Gladstone Road Technical Institute. The first theatre and cinema was also acquired then. Turkish baths were included as a facility of the theatre during its opening. In 1931, a new Town Hall was constructed from Portland stone and red brick by the council. This was located on the corner of Wimbledon Bridge and Queen's Road and the architects responsible for its construction were Hope and Bradshaw Gass. In the 1930s, the residential expansion in Wimbledon reached its peak and the focus for local growth shifted to Morden in the neighbouring area. Morden was no longer a village after the Underground arrived at the Morden station in the year 1926. A new railway branch line happened in the year 1930 connecting Wimbledon to Sutton. For this, a Portland stone facade was used for rebuilding the Wimbledon Station. This was done by Southern Railway. The ultimate building phase occurred at the time of the Second World War when major damage occurred to Wimbledon's housing stock and other portions in London. During this phase, the Victorian houses that were built earlier were demolished and apartment blocks were built in their places or these houses were sub-divided into various apartments. The borough council created local authority estates in the parts of Wimbledon Park that did not have any previous constructions and these estates were provided to individuals who were unfortunate enough to lose their homes. The London Government Act of 1963 eliminated the Municipal Borough of Wimbledon and Mitcham along with the Merton and Morden Urban District. In their place, the London Borough of Merton was created in 1965. In the early 1990s, the administrative centre of the new borough shifted from Wimbledon Town Hall to Crown House in Morden. During the seventies and eighties, the Wimbledon Town Centre had a hard time competing with Sutton and Kingston commercially as these two centres were a lot more developed. The shortage of large anchor stores to entice custom is a reason for this struggle. Failure of the council in finding a good solution for years led to the development of a shopping centre called the Centre Court. This brought the focus back to retail expansion. The Centre Court combined the old town hall building and the original designer of this building, i.e. Sir George Grenfell-Baines created a new portico along the lines of the old one designed fifty years ago. During the sixteenth and seventeenth centuries, people were attracted towards Wimbledon because of its recreational facilities and access to central London. 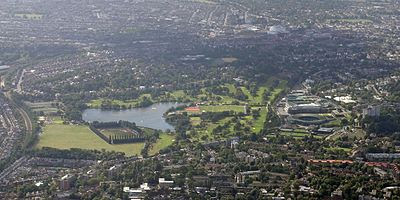 There were huge demands for homes in Wimbledon Park and Wimbledon Village, thus causing the prices to soar. The highest home prices were found in the outer London area.